Playing an incredible set filled with songs that truly put "Come With Me Now" to shame, fans happily danced along to the passionate songs of band that certainly needs to come back ASAP. 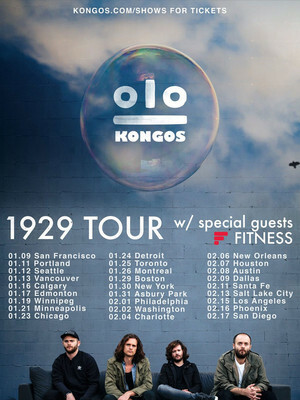 Formed by the four sons of iconic South African singer songwriter John Kongos, Kongos draw on the tribal music of their homeland and infuse it with an American classic rock edge, influenced by their relocation to the bluesy climes of Phoenix, Arizona. In 2012, the band's sophomore release 'Lunatic' saw breakthrough success in both South Africa and America, with album singles 'Im Only Joking' and 'Come With Me Now' dominating radio airwaves and advert soundtracks. Following a short hiatus after the release of their third album, the quartet is back with a brand new offering and is hitting the road on the 1929 North American tour with special guests Fitness this winter. Kongos' signature thundering drums, flaming guitar licks and solos, and soaring, anthemic vocal refrains make their music the stuff of arena-filling legend. Experimenting with accordion and syncopated rhythms, it is distinctively South African-influenced fair that's propelled them to international stardom, but the band isn't about to rest on their platinum-certified laurels. 1929's lead single "Real Life' is a surprising yet welcome departure from their usual breakneck rock speed, delivering a stripped back, melodic commentary on modern life and a desire for something more than the daily drudgery of a life spent in pursuit of material things. Seen Kongos? Loved it? Hated it? Sound good to you? 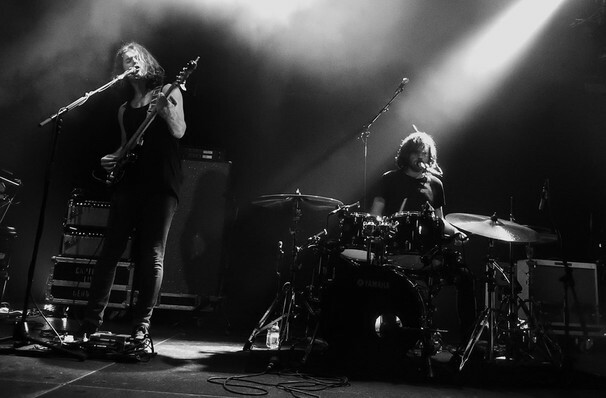 Share this page on social media and let your friends know about Kongos at Bowery Ballroom. Please note: The term Bowery Ballroom and/or Kongos as well as all associated graphics, logos, and/or other trademarks, tradenames or copyrights are the property of the Bowery Ballroom and/or Kongos and are used herein for factual descriptive purposes only. We are in no way associated with or authorized by the Bowery Ballroom and/or Kongos and neither that entity nor any of its affiliates have licensed or endorsed us to sell tickets, goods and or services in conjunction with their events.